Purport: Thus the brāhmanas, ksatriyas, śūdras and vaiśyas must execute their prescribed duties as these duties are stated in the śāstras. In this way everyone can satisfy the Supreme Personality of Godhead, Vishnu. The king, or government head, has to see that the citizens are thus engaged. In other words, the state or the government must not deviate from its duty by declaring that the state is a secular one, which has no interest in whether or not the people advance in varnaśrama-dharma. Today people engaged in government service and people who rule over the citizens have no respect for the varnāśrama-dharma. They complacently feel that the state is secular. In such a government, no one can be happy. The people must follow the varnāśrama-dharma, and the king must see that they are following it nicely. Purport: The state’s duty and the citizen’s duty are very nicely explained in this verse. The activities of the government head, or king, as well as the activities of the citizens, should be so directed that ultimately everyone engages in devotional service to the Supreme Personality of Godhead. The king, or government head, is supposed to be the representative of the Supreme Personality of Godhead and is therefore supposed to see that things go on nicely and that the citizens are situated in the scientific social order comprised of four varnas and four āśramas. In the Vishnu Purāṇa it is stated that unless people are educated or situated in the scientific social order comprised of four varnas (brāhmana, ksatriya, vaiśya and śūdra) and four āśramas (brahmacarya, grhastha, vānaprastha and sannyāsa), society can never be considered real human society, nor can it make any advancement towards the ultimate goal of human life. It is the duty of the government to see that things go on in terms of varna and āśrama. As stated herein, bhagavān yajña-pūruṣaḥ: the Supreme Personality of Godhead, Krishna, is the yajña-pūruṣa. As stated in Bhagavad-gītā (5.29): bhoktāraṁ yajña-tapasām. Krishna is the ultimate purpose of all sacrifice. 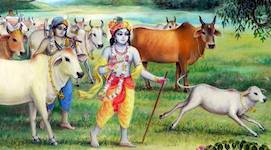 He is also the enjoyer of all sacrifices; therefore He is known as yajña-pūruṣa. The word yajña-pūruṣa indicates Lord Vishnu or Lord Krishna, or any Personality of Godhead in the category of vishnu-tattva. In perfect human society, people are situated in the orders of varna and āśrama and are engaged in worshiping Lord Vishnu by their respective activities. Every citizen engaged in an occupation renders service by the resultant actions of his activities. That is the perfection of life.